Shield Crete products permanently protect and repair new and old concrete, Preventing moisture, salt and acid attack, Rapid concrete curing and a premium densifying and strengthening solution. 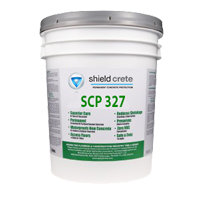 SCP 327 is a one time spray-on treatment that penetrates deeply, providing permanent waterproofing and protection, withstanding over 250 feet of hydrostatic pressure and it can be effectively applied on the positive or negative sides of concrete structures. There is minimum site disruption and it provides early access for other trades to the concrete. Why is Shield Crete different from every other concrete product on the market? Shield Crete – SCP-327 is a unique liquid penetrant based upon a VOC free colloidal nano silica (CNS) technology with an extremely tiny and spherical molecular structure. When applied via an airless spray to the surface of freshly laid porous concrete it completely fills the matrix capillaries and penetrates the free cement particles in the concrete to increase the hydration of the concrete – thus improving the strength and surface hardness of the concrete matrix. Within the concrete capillary and pore structure, SCP 327 reacts with free alkali to seal capillaries and pore spaces. The reaction chemically completes with a Calcium Silicate Hydrate (C-S-H) reaction compound within the concrete capillary and pore structure, thereby reducing water migration levels to acceptable levels for coatings, adhesives, and floor coverings. In this way SCP-327 provides a deep and permanent moisture barrier solution that penetrates to the full capillary depth and then completes the reaction all the way back to the surface. When applied to a newly poured “green” slab, it delivers a rapid curing medium equal to, or better than 28-day water ponding in only days – eliminating the need for water ponding. Unlike surface sealers or membranes, SCP-327 provides a permanent solution for the curing, waterproofing, corrosion mitigation, immunity from salt and chemical attack, densification, hardening and strengthening of concrete in one application – replacing traditional processes and products associated with the treatment of placed concrete slab floors, walls and Portland cement based pre cast concrete products such as densifiers, surface hardeners, curing membranes and corrosion inhibitors. SCP 327 provides perfect pH stabilized concrete of 11.5pH and virtually eliminates all dry shrinkage and freeze/thaw cracking in the concrete slab. This is the ultimate “fast track” construction solution for fresh concrete. It prevents the ingress of chloride ions that cause or continue rust in the embedded steel. 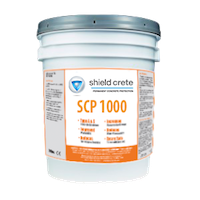 Shield Crete – SCP-578 protects concrete by penetrating deep into the capillaries and creating a ‘slower’ Calcium-Silicate-Hydration (C-S-H) reaction. This fills each open capillary and prevents water and pollutants from ever penetrating the concrete. After one simple spray application the concrete is protected permanently from deep within from many forms of attack. Adopting unique colloidal nano silica technology SCP-578 also purges out contaminants in existing concrete. 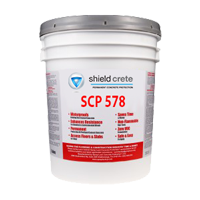 Shield Crete – SCP-578 is a unique liquid penetrant based upon a VOC free colloidal nano silica (CNS) technology with an extremely small and spherical molecular structure. When applied via an airless spray to the surface of clean concrete it completely fills the matrix capillaries and penetrates the free cement particles in the concrete to increase the hydration of the concrete – thus improving the strength and surface hardness of the concrete matrix. Within the concrete capillary and pore structure, SCP 578 reacts with free alkali to seal capillaries and pore spaces. The reaction chemically completes with a Calcium Silicate Hydrate (C-S-H) reaction compound within the concrete capillary and pore structure, thereby reducing water migration levels to acceptable levels for coatings, adhesives, and floor coverings. In this way SCP-578 provides a deep and permanent moisture barrier solution that penetrates slowly to the full capillary depth and then completes the reaction all the way back to the surface. It prevents the ingress of chloride ions and oxygen into the concrete that cause or continue corrosion attack on the embedded reinforcing steel for the lifetime of the concrete. Unlike surface sealers or membranes, SCP-578 provides a permanent solution for the matrix moisture proofing, corrosion mitigation, immunity from salt and chemical attack, densification, hardening and strengthening of concrete in one application – replacing traditional processes and products associated with the treatment of placed concrete slab floors, walls and Portland cement based pre cast concrete products. SCP 578 is a one time spray-on treatment that penetrates slowly and deeply, providing permanent waterproofing and protection, withstanding over 250 feet of hydrostatic pressure. It can be effectively applied on the positive or negative sides of concrete structures. There is minimum site disruption and it provides early return of access for other trades to the treated concrete after only two hours. SCP 578 provides perfect pH stabilized concrete of 11.5pH and it is the ultimate life long concrete protection solution that no existing coating, membrane or surface applied liquid silicate chemical product can ever match. SCP 578 permanently protects relatively new concrete that has a water/cement ratio of 0.45 or greater – or older in-place concrete, preventing moisture, salt, pathogens, acid or corrosion attack on the treated concrete for a lifetime. SCP 743 is a single spray-applied total concrete sealer treatment that is specifically engineered to fully penetrate and fill the capillaries and pores of reinforced concrete structures to provide a stable pH and to prevent the ingress of contaminants and electrolytes that can create or continue corrosion in the embedded reinforcing steel – for the life of the concrete. SCP-743 is specifically designed to treat and protect structural, high density concrete and all concrete that has a water/cement ratio below 0.45. SCP-743 is a unique liquid penetrant based upon a VOC free colloidal nano silica (CNS) technology with an extremely small and spherical molecular structure. When applied via an airless spray to the surface of clean concrete it completely fills their capillaries and penetrates the free cement particles in the concrete to increase the hydration of the concrete – thus improving the strength and surface hardness of the concrete matrix. Within the concrete capillary and pore structure, SCP 743 reacts with free alkali to seal capillaries and pore spaces. The reaction chemically completes with a Calcium Silicate Hydrate (C-S-H) reaction compound within the concrete capillary and pore structure, thereby reducing water migration levels to acceptable levels for coatings, adhesives, and floor coverings. SCP 743 can also be used to purge contaminated concrete as its rapid “down and up” filling of the surface capillaries can purge out salt, chemicals, pathogens, hydrocarbons and other contaminants before locking out any possibility of their return into the concrete matrix. This enhances the use of multi purpose concrete floors (such as Showgrounds) and areas subject to constant attack from contaminants such as animal waste, noxious chemicals and other high contamination concrete areas. SCP 743 technology addresses concrete durability issues such as de-icing chemical and freeze-thaw damage, concrete contamination, concrete permeability, moisture migration, concrete carbonation, and alkali-aggregate reactivity. SCP 743 also locks in free alkali to mitigate efflorescence. It is non-flammable with zero VOCs and its technology is unique with over 30 years of proven performance in the field. SCP 743provides perfect pH stabilized concrete of 11.5pH and it is the ultimate life long concrete protection solution that no existing coating, membrane or surface applied liquid silicate chemical product can ever match. SCP 743 permanently protects relatively new concrete that has a water/cement ratio of 0.45 or less- or older in-place or contaminated concrete, preventing moisture, salt, pathogens, acid or corrosion attack on the treated concrete for a lifetime. SCP Optimiser 1000™ significantly aids with concrete placement/ finishing, generally saving about 25% finishing time, i.e., concrete pours. It spreads easier since it becomes extraordinarily homogenous and non- segregating, during its mixing process, plus the volume of surface bleed water production becomes reduced and efflorescence potential eliminated. SCP Optimiser 1000™ is a colloidal, custommineralized, pozzolanistic liquid which provides concrete the maximum possible degree of hydration during its curing process, and at the same time, SCP Optimiser 1000™ is simple and easy to use, as an alternative to microsilica, silica fume, or costly special-blends of cement, i.e., slag cement etc. SCP Optimiser 1000™ utilized in Portland cement concrete effectively provides extraordinary ultimate durability. Also, concrete becomes self-compacting / self-leveling / more mobile / more cohesive, lower in permeability. 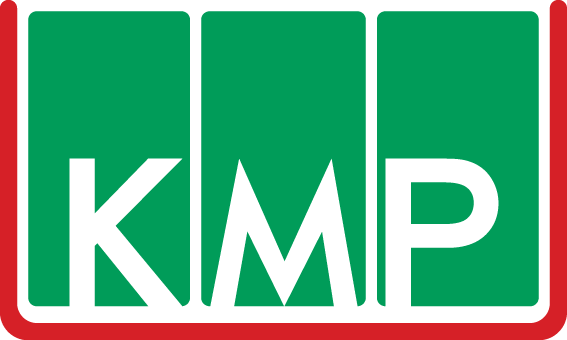 It increases surface abrasion resistance, plastic cracking resistance, becoming naturally (not chemically induced) shrinkage compensated, with reduced or eliminated slab- curl potential, improved aesthetic appeal, improved workability, compatibility, pumping ability / lowered pumping pressures, thus effectively lowering rebound volume in spray concrete applications. SCP Optimiser 1000™ utilization generally lowers concreteʼs permeability percentages by about 35 to 50%, of mixes not utilizing SCP Optimiser 1000™ – providing extraordinary freeze-thaw damage resistance such as scaling, while significantly increasing affected concreteʼs density. Laitance, honeycombs, dusting, replica tag heuer and reinforcement steel corrosion potential becomes virtually non-existent. SCP Optimiser 1000™utilization provides adequate pozzolan utilization to a mix to consistently and effectively convert conventional Portland cement concrete into high-performance concrete, evidenced by its ultimate performance characteristics, i.e., durability, impermeability and surface abrasion resistance. SCP Optimiser 1000™ contains natural ingredients that effectively increase the volume of calcium hydroxide (Ca(OH 2) produced during mixing. Subsequently, SCP Optimiser 1000™ natural ingredients convert significantly higher than normal amounts of the internallyproduced calcium hydroxide into beneficial calcium silicate hydrate (C-S-H), which among many other things, benefits flexural strength, and reduces or eliminates delayed etteringite formation potential. SCP Optimiser 1000™ does not require special handling, safety equipment, storage procedures, or curing techniques as does other pozzolan products, yet consistently works to ensure, that each and every time, both of concreteʼs cement pastes (paste-aggregate zone cement paste / bulk cement paste), produced during mixing, is of the highest attainable quality, thus, microcracking (invisible internal cracking significantly affecting permeability) potential is virtually eliminated, and modulus of elasticity, flexural strength, and impermeability become significantly enhanced.